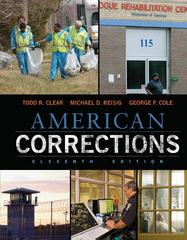 American Corrections 11 Edition Explore the American corrections system from the perspective of both the corrections worker and the offender in AMERICAN CORRECTIONS, Eleventh Edition. Comprehensive yet not overwhelming, the book covers both institutional and community sanctions, incorporating high-profile corrections cases taken from recent headlines to reinforce important theories. The authors "tell it like it is," offering you thought-provoking, unbiased examinations of such topics as assisting felons during the re-entry process, reducing recidivism, the death penalty, and surveillance. You'll also get a frontline view of careers in the corrections field.